Ellen Mae Franklin has turned in a winner with her first effort. Let me rephrase that. 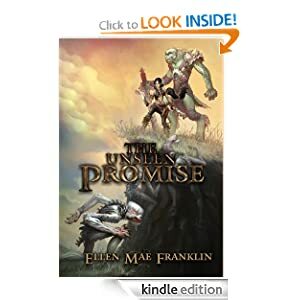 Ellen Mae Franklin has turned in THE fiction winner of the year with her first book “The Unseen Promise.” Why? The book is set on the alien world of Tarkeenia. It’s a world where everything happens–the good, the bad and the ugly. In many ways, it compares to our own world. Nothing is beyond the realm of possibility and morals, beliefs and attitudes change in a second. The research Ellen has put into making her creative world real is astounding. You really do come away believing that Tarkeenia is a real place. It also astounded me that she took such jaded and overused creatures and gave them fresh light. Think you know a dwarf? Hell, you don’t know ELLEN MAE FRANKLIN’S dwarf! Think you know about fantasy? Think again… She gives a brand new definition of the wordand you will not come away thinking that this is a million miles away from reality- trust me! On the downside–yes, there is a SLIGHT downside to this one–it is her first book and I would like to see how she progresses. I think by the time we get to the third volume of her Tarkeenia books, the world will really know how special Ellen is as a writer. Want to travel to those exotic lands? Try Tarkeenia. You won’t regret it! I have been asked many times what constitutes a “FIVE STAR REVIEW”… What makes a book THAT special? What did I expect from A Sufi’s Ghost? Well, I expected it to be a great read–I always have that expectation from Mark Biskeborn–and I expected it to be action-packed. I expect a lot, don’t I? Let me start by asking you as a reader what you thought of his last book, Mojave Winds? Now, don’t tell me you didn’t read it! That one was a slam dunk! Luckily, I am here to help you correct that small error. Mojave Winds was a great read and now, A Sufi’s Ghost is an even better read. Why? Because the writer has grown? Perhaps. Gotten better? Perhaps. Mainly because this is a top-notch action writer writing what he knows best– a rollickingly good story. Okay, well let me tell you that this is a story that takes you through the secretive world of Saudi Arabia, religion, politics and a world we cannot see as Westerners. Just the words bounty hunter and Saudi desert should have you digging around trying to find the Amazon account password to buy this one.Then we come to a Biskeborn essential, he throws in a beautiful partner in crime, Carmen, and you will find yourself looking for the nearest camel to have your very own Harem Holiday. What about his writing? Well, let me just tell you this first. Mark Biskeborn has really researched this book wonderfully. He has taken the time to paint a picture of a country, a desert seldom seen by most in the western world. He has researched all the nuances that could have made this book come unstuck. In short, he has written a book that I believe in and you will, too. Click here to read an interview with Mark Biskeborn and learn more about the man behind the writing. My latest review is for a book that has recently started to climb again in sales. Night of the Cossack is the first and current published effort by Tom Blubaugh. When I first opened the Kindle publication of this book I didn’t know what to expect. The idea of writing about pre-revolution Russia came to Tom, apparently when he discovered that his grandfather had been a Cossack. I kept this in mind as I got to the first page of the first chapter. The book opens with two brothers, Nathan and Israel Hertzfield, startled awake to find that their village is under attack from the Cossacks. The action packed start doesn’t dim… The action keeps rolling and rolling as the story of Nathan unfolds. Blubaugh has written an efficient and fast paced action adventure story for kids of all ages. The characterization is strong and the reader grows to know Nathan as a character. Nathan is a well developed character who always wants to do the right thing. That said, I think the fact that this book is a fictionalized attempt to create a back-story for his grandfather has made him biased towards the character of Nathan. Is that a bad thing? Perhaps, if you want a character who is multicoloured rather than just black and white. Blubaugh is a creative writer who without doubt has talent, but sometimes one does find oneself wondering how this book could have been better. I think it could have done with more edge, but then this is a book that will be enjoyed by pre-teens who aren’t in love with the trolls and goblins that seem so popular right now. What does happen to Nathan and Israel? What do the Cossacks do with them? Where do they end up? Why did the Cossacks attack? All these questions and more spring to mind. The book does ask many questions from the first page… You definitely find yourself turning the page to find out the answers, and I think that is one of this book’s strongest points. 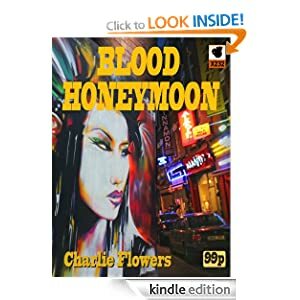 It is a page turner and you will want to finish it. I have interviewed Tom Blubaugh twice (click here and here for those) and I find him to be engaging and honest. He is a deep thinker and that comes across in the book, too. Perhaps he hasn’t written with a plan in mind, but subconsciously he has developed the characters and given them purpose. I found all the characters had purpose and all acted quite realistically, without the wooden behaviour some writers use. I will give Tom great credit for researching his subject thoroughly. The Cossacks are historically close to fact, the Okhrana, the troubles faced by a young Jewish boy living in an anti-semetic country; this book takes on the facts of the Russia we may have forgotten as history has moved on. The character of Nathan is always the Jewish boy trying to escape and Tom almost turns out his heart on some pages with poignancy and suffering. It is clear to me as a reader that this is the story that he has always wanted to write. All in all, this is a pretty good romp through the Russia of the Tsars and it will delight many people around the world as it has already. I also think it is a good first attempt and shows signs of what may come from Tom Blubaugh later. Sometimes an exclusive comes along. Today is one of those days. David Alvin is a prolific writer who has seen a steady rise in his sales since he wrote his first book. Today, he is more of a powerhouse than ever. His latest book is called Refugees From the Emerald City. I was able to snag a Q and A with David and THEN managed to get a copy of the book for review! See! Don’t say I am not good to you! Q) Hi David! Great to meet you for this exclusive. So, can you give my readers a rundown of what Refugees is about? I’m sure it would come better from you! A) Hey, Nick! Sure…What if the Nome King and his armies had conquered Oz? And let’s assume all the fantasy stories you read as kids (and probably still do read as adults, heck) ARE true, somewhere? It helps if you’ve read L. Frank Baum’s sixth Oz book, “The Emerald City of Oz,” but it’s truly not required — simply put, the Nomes and their evil allies dug an underground tunnel and got to the Emerald City, destroyed it and enslaved its people, and spread out over the land of Oz. AND BAUM COVERED IT UP. Enter David Garrett, a noted children’s book author who comes to Miami and is attending a symposium on the 100th anniversary of “The Emerald City of Oz” (so the novel’s set in 2010). He arrives at the hotel, but no symposium. In the process of finding out who got him there, he runs into Jamie with whom he graduated high school and is now a nurse in Miami. Then he meets Dorothy who escaped the Nomes. Then Guph, the general of the Nome army who after years and decades of successful conquest is finding himself — well, finding that something’s .. not … right. Enter the Reapers, characters drafted from failed versions of their to-us-fictional worlds where evil and darkness triumphed and introducing David, Jamie, Dorothy, and Guph who are asked to believe in more than they ever have and act in less than they’ve ever known … to get their histories right. Q) Fascinating stuff! This book has been quite a long time in the writing. Is it the book you’ve always wanted to write? A) I’ve always wanted to write an Oz book, but I must admit Refugees was not quite what I had in mind. I wrote this over a month in 2010 for National Novel Writing Month, so I had the general plot in mind for at least a year. I wanted its release to coincide with the 100th anniversary of the book it takes off from. For a few reasons that didn’t happen according to plan, but you know life … pure and simple, how do you and I relate to the revelation in our own time that there’s a lot more to reality that what we have experienced before? How DO we interact with our favorite characters when they’re flesh and blood and otherwise in front of us, not pixels on a screen or words and pictures on a page? It’s almost like Emma Swann’s epiphany in the TV show “Once Upon A Time” when SHE finds out that stories that she always regarded as fairy tales had/have a distinct reality of their own. That, and she’s part of the story. Q) As a writer you are rather prolific. Is it always your intention to draw a reader in as part of the story? That seems to be one of your themes. I can’t say I ALWAYS write that intention, but it bleeds through the more you commit to a story. I believe it has worked very well. Q) The big question! Is this your best work to date? Be honest! A) For its chosen subject? Yes! Q) Good to hear, David! Now for all your fans out there– have you got anything on the go as we speak?? A) Let’s see … “Victory,” the concluding novel of a superhero fantasy trilogy that’s the last chance to save the world in on its final pages now … “The Persian Trilogy” a Bible study of Ezra, Nehemiah, and Esther written along the lines of “The Burning Bush …” that you’ve previously reviewed . Those I KNOW are cooking! Q) Cooking crazily I’d say, David. Thanks for your time! A) Not a problem, Nick! David Alvin is known for writing long tomes. His previous works have included “The Burning Bush Wants to be Your Friend,” for example. Now, I sit and wonder to myself– what do I think of this latest book of his? Well it’s both good AND bad I’m afraid. It’s a great story, but I do think it could do with some improvement. However, let me get to that bit later. Let me ask you a question. Have you read Frank Baum’s sixth book “The Emerald City of Oz”? You did? That’s great– you are going to love this book. You didn’t? You may find yourself puzzled like me. For all you guys and girls who haven’t read the Baum book– it happens like this. The Nomes take over the Emerald City and then take over Oz. Everyone gets enslaved and a bad moon rises. It’s crisis in the world of make-believe. Now you are fully equipped to go and read this book by David Alvin. Without giving any secrets away, this book is a journey into an alternate reality. The story will help you wile away a few hours and leaves you with some satisfaction. David weaves a story that will be of interest to some of you– but for many of you– like me– you can find your eyes wandering off the page and looking for the latest cereal box to read. That said, if you give the book a chance you will get into it. I guess it all comes down to your love for Oz. Do you believe that you need a journey in Oz? I think if you do then you will be totally drawn into this book. Not to be too negative– David writes well and he writes with definite strokes of talent and love. He creates characters who are interesting and he has a great way with dialogue. He creates vivid fantasy characters and makes them talk, walk and jump off the page. At times he is long-winded, however; and a reader can find themselves losing track of what was said– back up two pages and find that nothing was said. I think the book could have been shorter and more concise. However, don’t let the long-winded paragraphs drag you away from the characters who are fantastically crafted. I just found it hard to get to the characters sometimes with all the flourishing descriptions and happenings taking place. What do I think of the concept? I think it’s great and I think David showed real respect to his favourite childhood writer. I do believe that this book will be too much of a trawl for kids, but I think a lot of adults will pick this up. Bestseller? Maybe.. Cult classic? More than likely. Movie? Maybe… An achievement for David Alvin? Certainly. Be proud of it, David, but please, next time say what you want to say in less time. The rest of the book works so well. I do believe that Refugees is this writer’s best work to date… Long live Alvin!